Pseudomonas aeruginosa is a Gram-negative, metabolically versatile opportunistic pathogen that elaborates a multitude of virulence factors, and is extraordinarily resistant to a gamut of clinically significant antibiotics. This ability, in part, is mediated by two-component regulatory systems (TCS) that play a crucial role in modulating virulence mechanisms and metabolism. MifS (PA5512) and MifR (PA5511) form one such TCS implicated in biofilm formation. MifS is a sensor kinase whereas MifR belongs to the NtrC superfamily of transcriptional regulators that interact with RpoN (sigma(54)). In this study we demonstrate that the mifS and mifR genes form a two-gene operon. The close proximity of mifSR operon to poxB (PA5514) encoding a beta-lactamase hinted at the role of MifSR TCS in regulating antibiotic resistance. 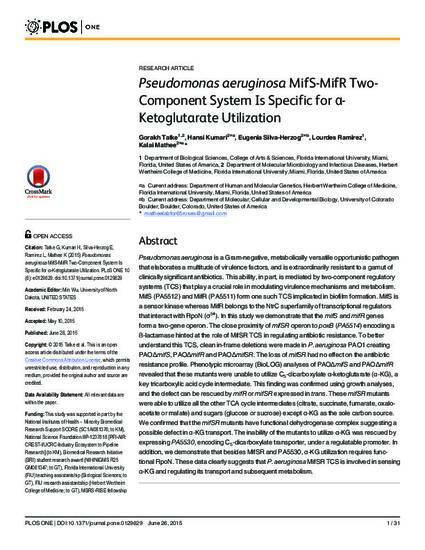 To better understand this TCS, clean in-frame deletions were made in P. aeruginosa PAO1 creating PAO Delta mifS, PAO Delta mifR and PAO Delta mifSR. The loss of mifSR had no effect on the antibiotic resistance profile. Phenotypic microarray (BioLOG) analyses of PAO Delta mifS and PAO Delta mifR revealed that these mutants were unable to utilize C-5-dicarboxylate alpha-ketoglutarate (alpha-KG), a key tricarboxylic acid cycle intermediate. This finding was confirmed using growth analyses, and the defect can be rescued by mifR or mifSR expressed in trans. These mifSR mutants were able to utilize all the other TCA cycle intermediates (citrate, succinate, fumarate, oxaloacetate or malate) and sugars (glucose or sucrose) except alpha-KG as the sole carbon source. We confirmed that the mifSR mutants have functional dehydrogenase complex suggesting a possible defect in alpha-KG transport. The inability of the mutants to utilize alpha-KG was rescued by expressing PA5530, encoding C-5-dicarboxylate transporter, under a regulatable promoter. In addition, we demonstrate that besides MifSR and PA5530, alpha-KG utilization requires functional RpoN. These data clearly suggests that P. aeruginosa MifSR TCS is involved in sensing a-KG and regulating its transport and subsequentmetabolism.